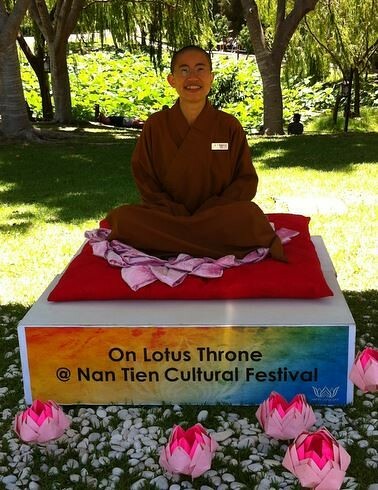 As an active member of the Fo Guang Shan Buddhist order, Venerable Dr. Juewei (覺瑋) is a lecturer of Applied Buddhist Studies and the director of the Humanistic Buddhism Centre at Nan Tien Institute (NTI) in Australia—the only institute of higher education in Australasia that bases its educational philosophy on Buddhist values and wisdom. In addition to Buddhist Studies, Ven. Dr. Juewei obtained postgraduate degrees ranging from Computer Science, Business Administration, to Future Studies. With her diverse academic and professional background, she has been effectively employing technology and social media to spread the Dharma. In this interview, Ven. Dr. Juewei shares her inspiring thoughts and adventures with loving-kindness. Buddhistdoor Global: Ven. Dr. Juewei, in your view, what is Humanistic Buddhism and how can people benefit from its teachings in everyday life? Ven. Dr. Juewei: First, please allow me to thank you, Stacy, for this opportunity to share my thoughts about something very close to my heart. For the past 20 years, I have been studying and practicing Buddhism, only to realize that this practice is one that not only has a tremendous impact on me, but also on those around me. Twenty years ago, I was attracted to Buddhist teachings that were modern and relevant: it went beyond the shrine, daily prayer, regular meditation, and classroom study. Of course, I acquired the habit of morning and evening chanting, daily private prayers, and mindful check-ins, as well as active Buddhist research. But what made my life most meaningful was meeting beautiful people and seeing how Buddhism made a difference in their lives. To me, Humanistic Buddhism is “bringing the human back to our being” and “people becoming Buddhas through other people.” It is using the Buddha’s precious teachings to enrich our lives so that we can perfect humanity. It is making life worth living! Venerable Dr. Juewei at NTI. Image Courtesy of Ven. Dr. Hence, I started the Turning Points: Stories of Humanistic Buddhism project this year. We collected real stories of ordinary people who have used the Dharma to transcend the vicissitudes of life. For example, one Australian manager ceased drinking alcohol in nine months after realizing that he could not create a permanent “good” feeling from impermanent phenomena. A therapist told how she managed living together with her mother and her husband under the same roof, by using the teachings of cause and condition to appreciate each moment. Another person, a young graphic designer, realized that his desire for perfection and praise was the cause of his inability to accept criticism, and hence, he used the tenet of non-self to transcend such self-centeredness. One story at a time, I have been touched by the transformations people have undergone through the practice of Humanistic Buddhism. BDG: What are the challenges of facilitating the study of Buddhism in a Western country like Australia? What do you and your colleagues want to achieve with NTI? VDJ: Since our first class in Applied Buddhist Studies started in 2011, NTI has seen a growing interest in its postgraduate programs. There are two major hurdles to overcome when encouraging the study of Buddhism in the west. The first challenge is that English speakers today tend to equate Buddhism with mindfulness and/or meditation. The second is the widely accepted perception that Buddhism does not require academic study. While there is a large population of people interested in learning how to meditate, significantly fewer people want to learn the principles and uncover the evidence that underlie their mindfulness training. Beyond mindfulness, NTI also offers classes in Buddhist Ethics, Buddhism and Modern Society, Buddhist Art as Visual Communication, and more. Furthermore, Humanistic Buddhism seeks to serve society by using engaging and modern means. At NTI, we see ourselves as facilitators on our students’ road to enlightenment. Together with our students, we create a quality environment to promote the harmony and philosophy of Buddhist wisdom in public life through self-awareness and self-education. Academic rigor is skillfully combined with cross-cultural empathy so that our graduates have the analytical and critical skills, as well as the empathy, to apply their knowledge to new situations for the greater good. BDG: What is your role in the Buddha’s Birthday Education Project? I am very impressed by your use of animation, documentaries, and smartphone apps to illustrate Buddha’s stories and teachings. How are Buddhism and technology related to each other in modern times? VDJ: I founded the Buddha’s Birthday Education Project (BBEP) in 2011, with the idea of bringing ancient canonical, literary, and epigraphical records about the Buddha’s birthday celebrations to life through art and technology. It began with a thought, and like an unstoppable series of events, one good thing led to another. The thought that gave birth to the project occurred in early 2011, when I felt that the rigorous findings of academic research should extend to a wider audience. Therefore, I invited an artist, architect, animation technologist, graphic artist, musician, curator, website developer, tailor, and many other talents to turn my PhD dissertation into an exhibition in Los Angeles, South Bank, and Las Vegas in the US. That thought, embodied in the exhibition, continued its journey internationally to Wollongong, Sydney, Melbourne, Perth, and Brisbane in Australia, and Kuala Lumpur in Malaysia. However, physical exhibitions are still limited; they are only open to visitors during the period of the show. Hence, the team reached out to the world with websites and mobile apps. In the spirit of Humanistic Buddhism, we hope to spread joy and harmony in the world through greater mutual understanding. There is much that we can learn from ancient wisdom. For example, more than 1,500 years ago, a mechanical engineer created an altar carriage that carried nine dragons showering water over a central Buddha; there were also 10 wooden monks that could circumambulate the Buddha and bow to the Buddha! This ancient record became the theme of an animation, a documentary, and physical models. By representing this piece of history using modern media, our forefathers could serve as a model of creativity and tenacity. BDG: You have mentioned that the project received a lot of support from volunteers. Where are they from? Are they all Buddhists? VDJ: The exhibits of the BBEP were made possible by a network of dedicated international volunteers. They are mainly based in Sydney and Wollongong, but also in the US, other parts of Australia, Taiwan, Singapore, Malaysia, Shanghai, and Hong Kong. Our meetings and electronic correspondence are often complemented by video-conferencing. These tireless volunteers come from different walks of life and contribute to this project with their own expertise. While most of them are Buddhists, some are not; we meet in fellowship and in an infectious spirit of altruism. I cannot help but feel touched by the many hands (both visible and invisible) that have brought this project to fruition year after year, initiative after initiative. BDG: Could you please tell us more about yourself? 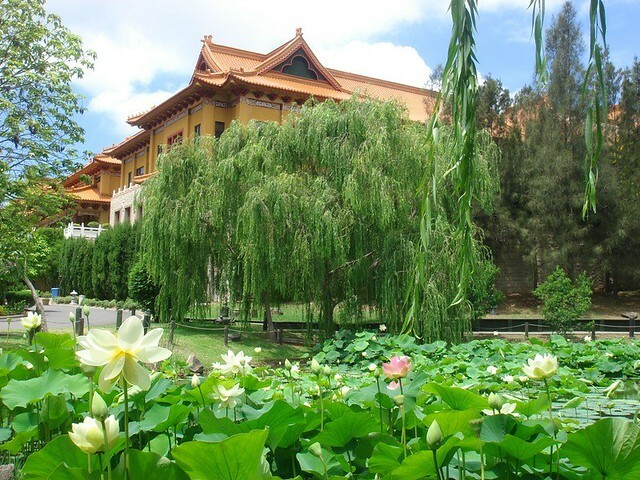 What made you decide to become a bhikkhuni and join the Fo Guang Shan Buddhist order? VDJ: My first job was about building artificial intelligence systems and I often tell people that I have come a full circle since then, by learning about natural wisdom now. I used to work in public service in Singapore and now I am still working as a public servant, but with the world as my stage. I decided to be tonsured under Ven. Master Hsing Yun because of his humane leadership. I am aware of the difficulty of finding transformational leaders these days and hence, I joined Fo Guang Shan to create a meaningful life, for myself and others. When I was first asked why I entered the Buddhist college, my intuitive answer was to “find myself.” The response I received was that “I” was garbage. This was followed by the questioner literally picking up a piece of garbage and throwing it into a bin. That gong’an (a Buddhist lesson to provoke doubt) has lived with me ever since. As I remove the burden that came with many years of merit-based education, career promotions, and appealing conditions, I have become “enlightened” to the precious treasures (conditions) that have made me who I am. It is not a path undertaken in vain. BDG: I am wondering who your role models are and where you draw your inspiration? VDJ: My number one role model is Ven. Master Hsing Yun. Whenever I encounter any difficulties, I often ask myself what he would do under the same circumstances. Of course, if I had his level of wisdom, I would not put myself in inconvenient conditions, but his writings were invaluable to me to clear negative thoughts. For example, when in pain, I will recall master saying that we should befriend our illness. Instead of struggling with the pain, I dialogue with it and acknowledge it as a rightful inhabitant of this body. Of course, my role models are everywhere in life. My favorite TV series is Star Trek: “to boldly go where no man has gone before.” Because of my tendency to operate outside of my comfort zone, the BBEP has been doing something new each year, for the past six years. Every person I encounter has something for me to learn from. Stacy, you are an inspiration too. Your ambition to make the best of Chinese Buddhist art available to both the English- and Chinese-speaking public will extend the reach of culture in an increasingly technological and business-minded world. May we all create and enjoy a Pure Land here on earth, whereby everyone can feel joyous and live harmoniously with one another! To enjoy the apps developed by Ven. Dr. Juewei and her colleagues at Nan Tien Institute, please see the details below.